Solar Power "Boosts Sp. Atk, but lowers HP in sunshine. 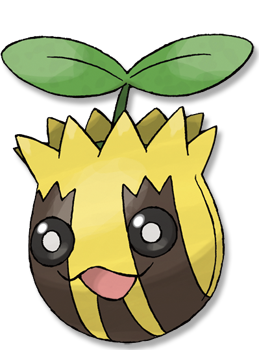 "This Pokemon's max HP lowers and Special Attack rises one level during Sunny Day. Early Bird* The Pok�mon awakens quickly from sleep. "This Pokemon wakes up from Sleep in half as many turns, including Sleep from Rest." Leaf Green It may drop out of the sky suddenly. If attacked by a SPEAROW, it will violently shake its leaves. Diamond/Pearl It suddenly falls out of the sky in the morning. A year after a cold summer, their population explodes. Heart Gold It may plummet from the sky. If attacked by a SPEAROW, it will violently shake its leaves. Soul Silver It lives by drinking only dewdrops from under the leaves of plants. It is said that it eats nothing else. White It suddenly falls out of the sky in the morning. A year after a cold summer, their population explodes.